The Noble Collection evokes the spirit of nobility and is inspired by Clive Christian’s passion for horticultural, architectural and artistic movements that shaped key periods in history. 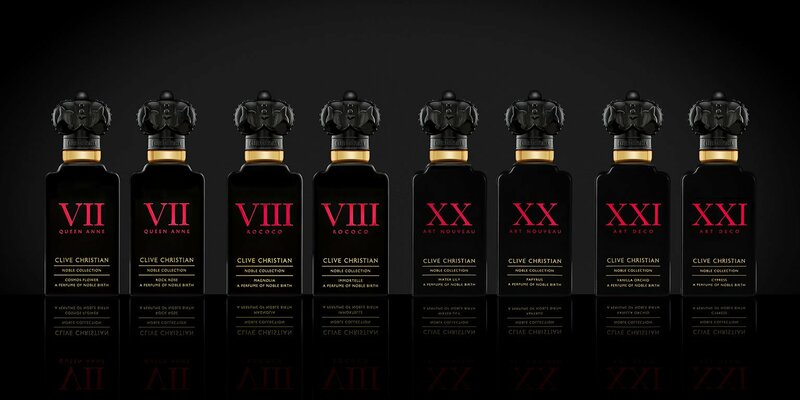 As is characteristic with all Clive Christian perfumes, each creation captures a true sense of creativity and passion.The Noble Collection is no exception. 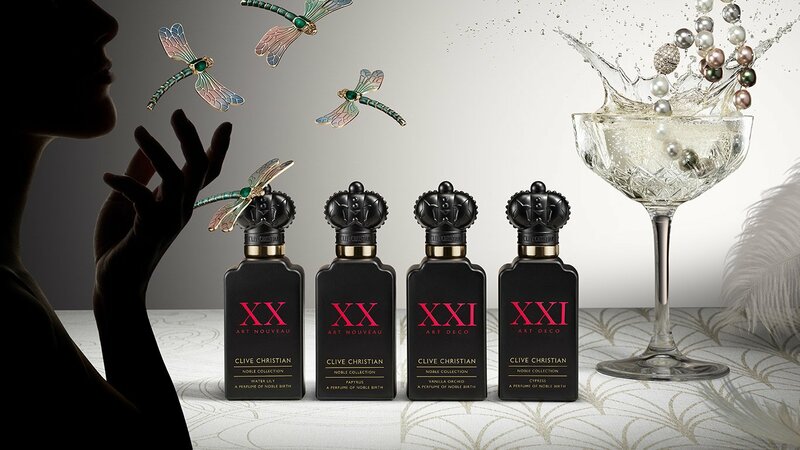 It celebrates the opulence and ideology of these prominent eras and explores ingredients and aesthetics to aid in perfectly shaping each perfume’s scent promising magic and allure in equal measure. A celebration of the organic, rhythmic patterns representing artistic freedom and sensuality alongside a delicate yet enticing colour palette created a completely new aesthetic; Art Nouveau was born out of the desire for modernity and a sense of breaking free from constraint. Born in Paris and travelling globally from the early 1890’s the spirit of this age is fresh and educated with a sense of sparkling exuberance. An elegant floral chypre delights with iris and tuberose. 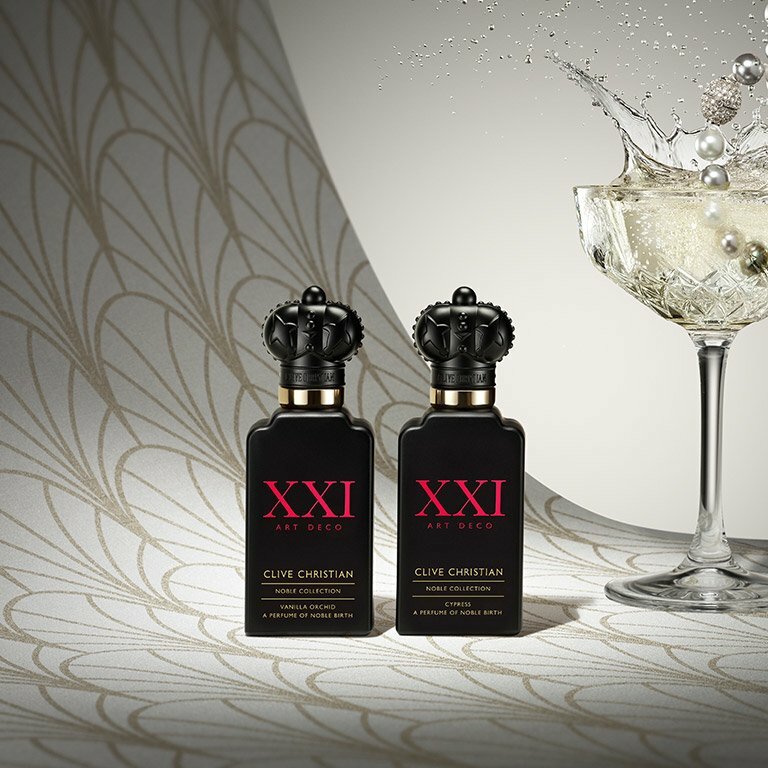 Aldehydes and green leaf sparkle with effervescence at the top to compliment the unfurling elegance of the floral heart. A sensual musky fougere with the classic celebration of lavender and vetiver. The green notes of galbanum travels energetically with the suggestion of pepper into a lush herbal heart of geranium, basil and tingling ginger. A modern phenomena in design; Art Deco is a style recognised globally and can be seen in details from the grand scale of a sky scraper to the most utilitarian of objects. Originating from Paris this decadent style roared through the 1920’s heavily in uencing art and architecture. Precious blooms that flower for just a single day, sensual vanilla orchid juxtaposes charmingly against the sharp lines of green galbanum and crisp hyacinth.The heart unfolds into a heady oral melee before delving into a warm and sweet base. Exuding memories of the French Riviera the spicy and coniferous scent of cypress stands elegantly against the zest of bergamot with a bold body bolstered with cedar for a modern take on the opulence of the Art Deco era.